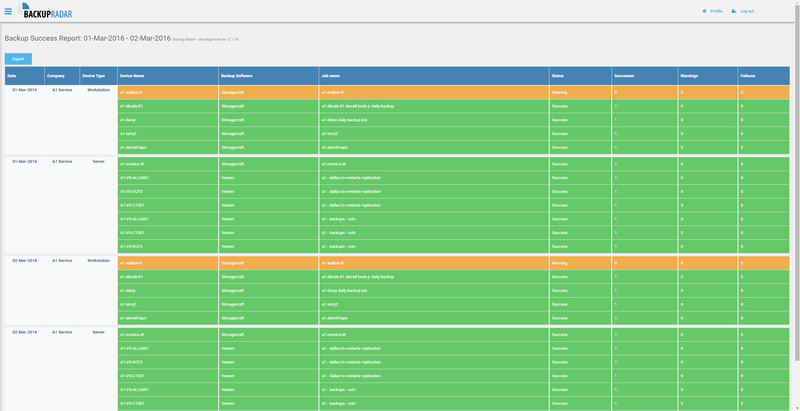 MSP / IT Administrator Friendly Console and Audit Screens. Global search for any backup or job name. A copy of each backup email report received is attached in the Audit screen. Failures and Warnings sorted to the top to make it easy to start troubleshooting. Backups that do not receive an email report show a failure so they can be reviewed. Sort and filter based on a company, backup type, device, and tags. See the number of days since a backup was successful. Group by Company or Sort all failures and warnings to the top across all clients. Filters & Options allow you to customize which tickets are created. Add an existing ConnectWise or Autotask ticket to the backup result. View the complete ConnectWise or Autotask ticket history for a backup. Access to the full ConnectWise or Autotask ticket through web link. 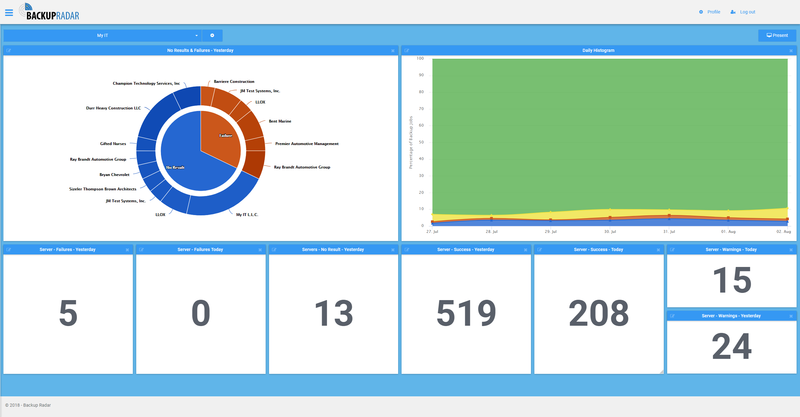 Dynamically updating Dashboards for your backup content. Daily Pie Graph clickable chart for granular views into each day. Clickable live tiles to drill down into the data on the dashboards. Spot ongoing trends for failures or warnings with your backups. Backup Overview Report to provide a customer with a monthly overview of their backups. Backup Detail Report shows a full audit report that has filters and date range selections. Weekly Report for spotting recurring failures easily. Backup List Report that will show the list of backups for a client. Parsing report allows you to see what emails were not parsed by Backup Radar. All reports are brandable and exportable to PDF and Excel. Scheduled Reporting of Daily, Weekly or Monthly backup reports. Ability to create multiple notification profiles. Adds a layer of management to notify someone if a backup doesn't succeed in x number of days. Custom Backup Thresholds - Customized thresholds allow you to set when to be notified about a failure. Bulk Edit Backups - Search and bulk edit Backups when you need a change to multiple backups. Flexible Custom Schedules - Create granular custom schedules based for when a backup report is received. 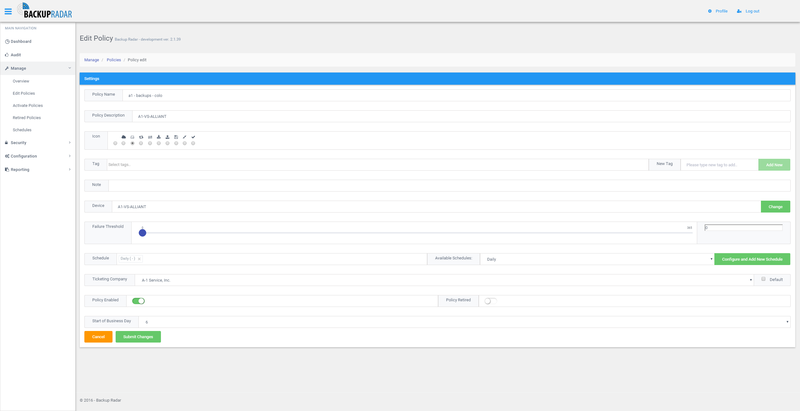 Custom Tagging System - Tag a backup and utilize the filter for viewing on dashboards and the audit screen. Built on Microsoft Azure Platform / No Software or Hardware required. Desktop, Tablet and Mobile responsive access to backups and reports. 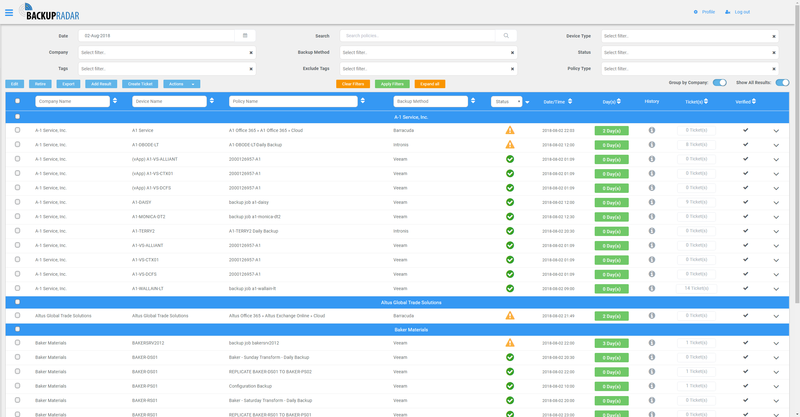 Secure multi-tenant access to assign backups to the clients or companies that they belong to. 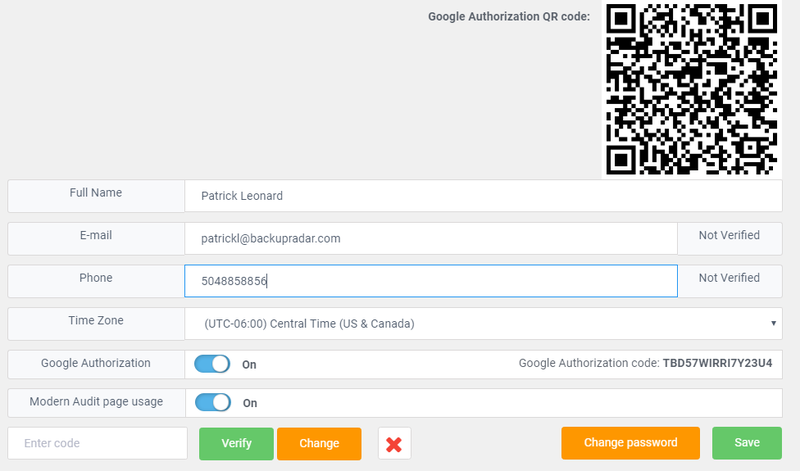 Multi-Factor Authentication for additional security through Google Authenticator. Granular permissions for your user accounts. Grant or Deny permission to client accounts per user.